The answer to our challenge, How to Love Jesus is clearly answered where Jesus tells us clearly…..
• That’s what it’s like for Jesus when he joined his disciples for the Passover meal. • His death would be the final atonement, the covering, the payment, the satisfaction for sin that thousands of years of sacrificing innocent lambs prefigured. • 2 The evening meal was in progress, and the devil had already prompted Judas, the son of Simon Iscariot, to betray Jesus. 3 Jesus knew that the Father had put all things under his power, and that he had come from God and was returning to God; he got up…..
• They were about to feast! • 12-17 When Jesus had washed their feet and put on his clothes, he sat down and spoke to them, “Do you realize what I have just done to you? You call me ‘teacher’ and ‘Lord’ and you are quite right, for I am your teacher and your Lord. But if I, your teacher and Lord, have washed your feet, you must be ready to wash one another’s feet. I have given you this as an example so that you may do as I have done. Believe me, the servant is not greater than his master and the messenger is not greater than the man who sent him. Once you have realized these things, you will find your happiness in doing them. • The pettiness of the person is never the point, whether they deserve it or not is never the point. 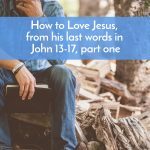 The point is…how can we be more like Jesus? • You are writing a gospel, a chapter each day, by the things that you do and the words that you say. People read what you write distorted or true, what is the gospel according to you? • John 14:26 I have said all this while I am still with you. But the one who is coming to stand by you, (the Advocate, the Comforter) the Holy Spirit whom the Father will send in my name, will be your teacher and will bring to your minds all that I have said to you. • Invariable you will be confronted with a challenging situation. • Are you going to love Jesus and grow in your relationship to him by obeying. • I pray so—that you will obey and grow. • Horatio G. Spafford was a successful lawyer and businessman in Chicago with a lovely family – a wife, Anna, and five children. . . . . .Their young son died with pneumonia in 1871, and in that same year, much of their business was lost in the great Chicago fire. Yet, God in His mercy and kindness allowed the business to flourish once more. • On Nov. 21, 1873, the French ocean liner, Ville du Havre was crossing the Atlantic from the U.S. to Europe with 313 passengers on board. Among the passengers were Mrs. Spafford and their four daughters. Although Mr. Spafford had planned to go with his family, he found it necessary to stay in Chicago to help solve an unexpected business problem. . . . .
• About four days into the crossing of the Atlantic, the Ville du Harve collided with a powerful, iron-hulled Scottish ship, the Loch Earn. Suddenly, all of those on board were in grave danger. Anna hurriedly brought her four children to the deck. She knelt there with Annie, Margaret Lee, Bessie and Tanetta and prayed that God would spare them if that could be His will, or to make them willing to endure whatever awaited them. Within approximately 12 minutes, the Ville du Harve slipped beneath the dark waters of the Atlantic, carrying with it 226 of the passengers including the four Spafford children. • Mr. Spafford booked passage on the next available ship and left to join his grieving wife. With the ship about four days out, the captain called Spafford to his cabin and told him they were over the place where his children went down. • According to …a daughter born after the tragedy, Spafford wrote the hymn “It Is Well With My Soul” while on this journey. • It is well, it is well with my soul. • It may not be easy to love Jesus by taking time to learn his commands and to obey them, but the gift of his love and peace no matter what the storms of life and the promise of forever with him make any efforts on our part more than worth it.